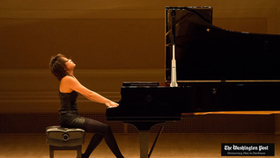 Critical superlatives and audience ovations have continuously followed Yuja Wang's dazzling career. 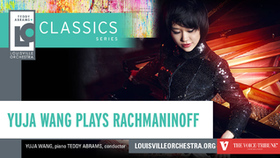 The Beijing-born pianist, celebrated for her charismatic artistry and captivating stage presence, is set to achieve new heights during the 2018-19 season, which features recitals, concert series, as well as season residencies and extensive tours with some of the world's most venerated ensembles and conductors. She begins the summer of 2018 with a performance of Beethoven's Piano Concerto No. 1 at the Tanglewood Music Festival with the Boston Symphony Orchestra, under the baton of Andris Nelsons, followed by a tour with the Berlin Philharmonic Orchestra and Kirill Petrenko featuring Prokofjew's Piano Concerto No. 3. Later engagements include an extensive recital tour to South America, as well as several concerts with the Munich Philharmonic and Valery Gergiev throughout Asia in autumn. She is featured as an Artist-in-Residence at three of the world's premiere venues: New York's Carnegie Hall with a season-long "Perspectives" series, the Wiener Konzerthaus with a "Portrait" series, and also at the Luxembourg Philharmonie. Engagement highlights include concerts with the Vienna Philharmonic Orchestra at Versailles, as well as the Summer Night Concert at the Schönbrunn Palace with Gustavo Dudamel. She also embarks on tours with the City of Birmingham Symphony Orchestra and Mirga Gra?inytė-Tyla. 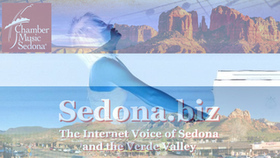 Other notable appearances include concerts in Istanbul, Toronto, Los Angeles, Chicago, and Kotor. 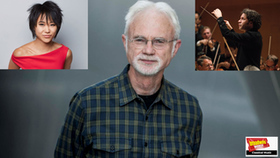 Spring of 2019 sees Yuja embark on a tour of Los Angeles, Seoul, and Tokyo with the Los Angeles Philharmonic Orchestra to give the first-ever performances of John Adams' newest piano concerto, as well as reuniting with cellist and frequent collaborator Gautier Capuçon for a vast US chamber tour. Her combination of technical ease, colouristic range and sheer power has always been remarkable … but these days there is an ever-greater depth to her musicianship, drawing you into the world of each composer with compelling immediacy. 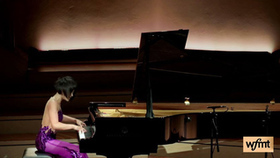 Yuja Wang was born into a musical family in Beijing. After childhood piano studies in China, she received advanced training in Canada and at Philadelphia's Curtis Institute of Music under Gary Graffman. Her international breakthrough came in 2007 when she replaced Martha Argerich as soloist with the Boston Symphony Orchestra. Two years later, she signed an exclusive contract with Deutsche Grammophon and has since established her place among the world's leading artists, with a succession of critically acclaimed performances and recordings. 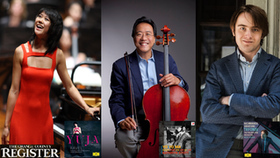 Yuja was named Musical America's Artist of the Year in 2017. There were only two moments of true, reflective stillness during last night's Los Angeles Philharmonic program at the Walt Disney Concert Hall. 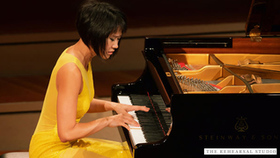 One occurred when pianist Yuja Wang held the audience spellbound with her diaphanous reading of John Adams's "China Gates" for solo piano, distilling every ounce of neoimpressionist perfume from this early-career work. She played this piece as an encore after the world premiere of Adams's latest, an L.A.-Philharmonic-commissioned score, the piano concerto "Must the Devil Have All the Good Tunes? ", which provided the evening's other instance of rapt repose. 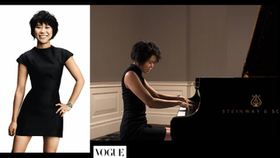 Thirty one-year-old piano virtuoso Yuja Wang was born in China and was a stand-out talent from a very young age. She studied in Canada and the United States and today lives, more or less, in New York - though she's in such demand that she's rarely home at all. Back in 2017, John Horn spoke with her at Disney Hall as she was preparing for an engagement with Gustavo Dudamel and the L.A. Philharmonic. 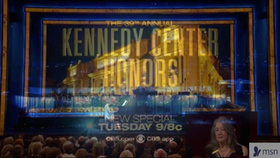 Today we revisit that interview, following her Grammy nomination last week in the Classical Instrumental Solo category for her recording of Bartók's Piano Concerto No. 2 with Simon Rattle and the Berliner Philharmoniker. WRTI's Mark Pinto, host of the Classical New Releases show, fills you in on the latest and greatest classical music CDs every Saturday at 5 pm. Here are five newly released recordings he recommends. The wonder that is pianist Yuja Wang is on amazing display in her blazing new recording of the Ravel concertos for one and two hands. In the G Major concerto, Wang is particularly adroit in the percussive effects and simply fearless in the fast passagework and lightning-quick repeated notes. And almost miraculously in the Left Hand concerto, she keenly divines the melodic line from Ravel's furious thickets of notes. As poetically sensitive as she is technically assured, Wang is also able to convincingly project Ravel's moments of impressionistic delicacy and quiet reflection in these works. The Tonhalle Orchestra turns in a command performance of its own, whether digging in with Wang in the bluesy sections, matching her ferocity in the thunderous moments, or staying perfectly in-sync with her through all the mad dashes. In between the concerto performances here, Wang tackles the seldom-heard solo version of Fauré's Ballade in F# and beautifully captures all its inherent drama. With her clean passagework, clear articulation of every note, and sparing but effective use of rubato, Wang is simply poetry in motion.